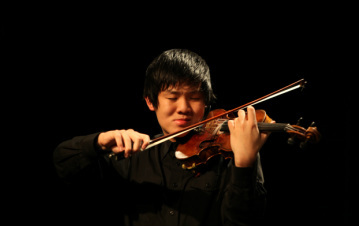 Violinist Albert Cao, 17, from Freehold, New Jersey, will attend Colts Neck High School as an upcoming senior. He began his violin studies under the tutelage of his grandfather at the age of 6. He was accepted into the Juilliard Pre-College division at the age of 11. He has placed honors in competitions such as the New Jersey Young Artists competition, New Jersey Strings Association competition, and the Monmouth Symphony Orchestra competition. He won grand prize in the Crescendo International Competition, and first in NJ ASTA. In past summers, he has attended the Waterville Valley Music Festival, as well as the Meadowmount School of Music. Albert currently studies with Ms. Ann Setzer at the Juilliard Pre-College.